shibaa987 1 year, 6 months ago. The much awaited Android Nougat 7.0 ROM, CM14 for Galaxy S5 CM14/CyanogenMod 14 has now arrived through an UNOFFICIAL build. In addition to this ROM, here comes the Android Oreo based Galaxy S5 Lineage OS 15 ROM. We also have Lineage 14.1 for Galaxy S5, Nougat 7.0 AICP ROM for Galaxy S5 and OFFICIAL CM14.1 ROM for Galaxy S5. For latest updates, stay tuned to the Lineage OS device list page. Since Google released Android Nougat Source code, we have update many Android NOUGAT AOSP ROMs and also many CyanogenMod 14/CM14 ROMs updated and many are yet to come. If you are looking CM14 for Verizon model then here is the Verizon Galaxy S5 CM14/CyanogenMod 14 Nougat 7.0 ROM This CyanogenMod 14/CM14 for Galaxy S5 is brought to you by developer Blackjubel. If you like his work and want him to keep up his good work, then you can Donate him via PayPal using this link. There is another CM14 brought to you by haggertk. THIS IS STILL AN EARLY BUILD. THIS ROM MAY NOT BOOT AT ALL OR EVEN IF IT BOOTS IT MAY CONTAIN MANY BUGS THAN YOU CAN IMAGINE MAKING IT UNUSABLE AS A DAILY DRIVER. TRY AT YOUR OWN RISK. Installing custom ROM requires a custom recovery to be installed on your device, which may VOID your warranty and may delete all your data. Before proceeding further you may consider backup your all data. You are the only person doing changes to your phone and neither the developer(s) nor we can be held responsible for the mistakes done by you. Download and Copy the GApps and Galaxy S5 CM14/CyanogenMod 14 ROM ZIP to your phone. Reboot and Enjoy the CM14 for Galaxy S5. 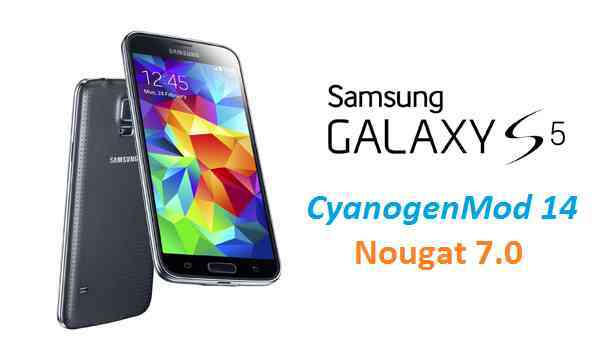 Copy the latest Galaxy S5 CM14/CyanogenMod 14 ROM ZIP file to your phone. Stay tuned or Subscribe to the Galaxy S5 (g900f, klte) forum For other Android Nougat ROMs, CyanogenMod 14 ROMs, other ROMs and all other device specific topics. My phone app freezes when I get a call. I can’t answer. Besides that all is good. The “last app” functionality seems broken btw. I am having issues with SMS. Anyone else? I installed CM14.1 on my S5 on Friday. Worked great until this morning and now I can’t get SMS yo work. Will not send or receive. When I try to send it tries for awhile “sending” then fails. I have tried the stock SMS app and Google SMS app. Nothing works. Any ideas? is working dual sim cards?